World Contraception Day annually takes place on September 26th. The worldwide campaign is centered on a vision where every pregnancy is planned and wanted. This year, Kisumu County joined the rest of the world in celebration at the Simba Opepo Dispensary. County officials and over 10 partners attended, with Deputy Governor Dr. Mathews Owino as the chief guest; he expressed commitment to the county leadership and its growth. 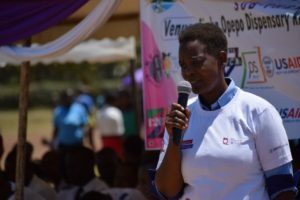 The community came together to promote and echo important actions on Family Planning (FP) and contraceptives, improve awareness on contraception, and enable young people to make informed reproductive health choices. Healthcare workers were encouraged to support clients in selecting appropriate FP methods and discussing possible side effects. There is a need in the community for counseling on correct methods and their associated potential warning signs. Further, the celebration called for the mentoring of healthcare workers in order for them to have the right attitude towards youths. This attitude will allow patients to freely walk into health facilities and access services to avoid repercussions of unsafe abortion attempts, honestly and openly discuss their reproductive issues, and avoid over the counter purchase of FP services without thorough check ups. Male involvement was also advocated for in family planning because it is a strategy for addressing pressing world reproductive health problems. Men can assist in preventing early and unintended pregnancies, as well as foster safe motherhood and practice responsible fatherhood. This helps both parents plan their families in accordance with their needs and resources. Kisumu County has 138 public and 72 private health facilities offering FP services. Yet, despite efforts to increase availability, studies show that only 60% of the Kisumu community has access to the public health facilities and services. Therefore, prevalence of modern contraceptive use remains low. 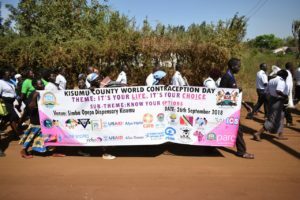 The partners represented at World Contraception Day emphasized the integration of all sectors; unless all sectors are unified and not working in isolation, the county will now achieve its sustainable developments.